Since 2004, the Pour Moi Cosmetic Clinic has been offering Botox treatments to local people in Bournemouth, Poole, and Dorset. In that time we have built up an excellent reputation, with the reviews we receive being testament to the quality of service we offer. 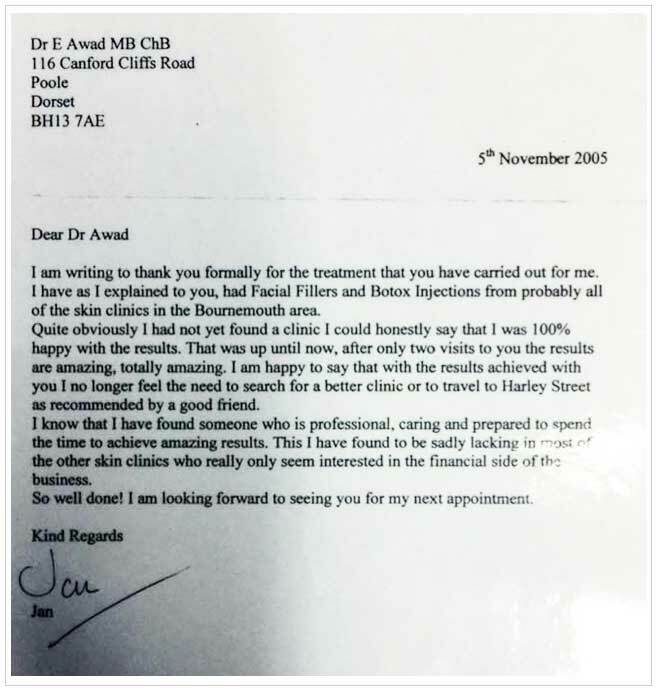 Dr Awad started out as a practitioner in 1995, and below is a short selection of some of the client reviews received in that time. We will continually be updating this section with new testimonials as and when we receive them, but for now here are just some highlights. The What Clinic website lets people search for outstanding cosmetic clinics in the UK, including those that work in the field of Botox. 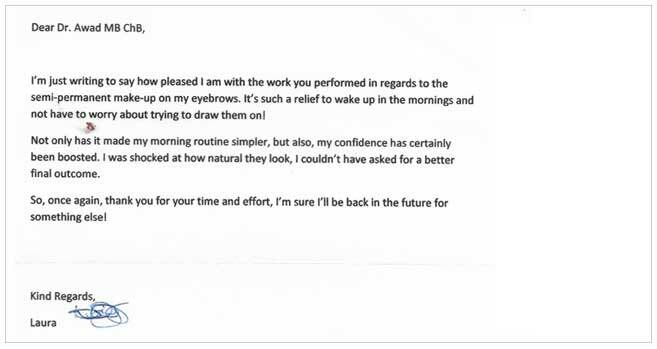 Below is a screenshot of a phone-verified real client testimonial and recommendation that we have received regarding our cosmetic treatments and procedures. To read all of our reviews on the independent What Clinic website please click here. 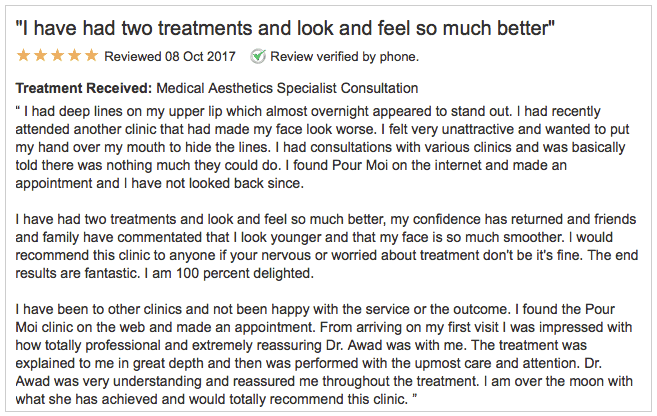 The Pour Moi Cosmetic Clinic and Dr Awad regularly receive reviews for not just our Botox procedures, but also for a wide range of cosmetic treatments that we offer our clients. 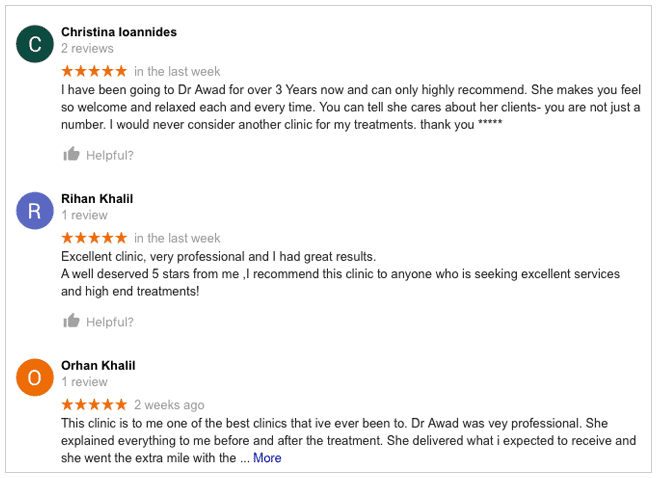 You can see a selection of those comments in the screenshots below, or if you would like to see them for yourself, and view the most current testimonials simply Google our clinic name to view them. 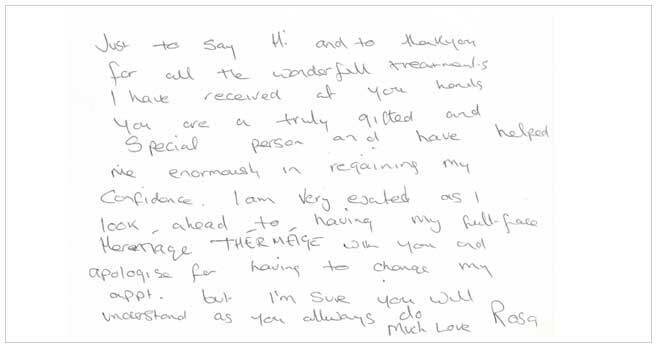 We will also regularly receive letters and emails from our happy clients. 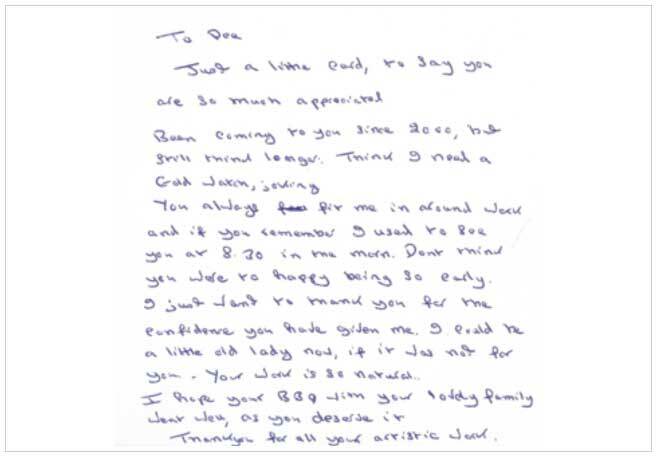 Below are some scanned letters and emails of thanks that we have received down the years from our local Bournemouth and Poole clients. I had deep lines on my upper lip which almost overnight appeared to stand out. I had recently attended another clinic that had made my face look worse. I felt very unattractive and wanted to put my hand over my mouth to hide the lines. I had consultations with various clinics and was basically told there was nothing much they could do. I found Pour Moi on the internet and made an appointment and I have not looked back since. I have had two treatments and look and feel so much better, my confidence has returned and friends and family have commentated that I look younger and that my face is so much smoother. I would recommend this clinic to anyone if your nervous or worried about treatment don’t be it’s fine. The end results are fantastic. I am 100 percent delighted. I have been to other clinics and not been happy with the service or the outcome. I found the Pour Moi clinic on the web and made an appointment. From arriving on my first visit I was impressed with how totally professional and extremely reassuring Dr. Awad was with me. 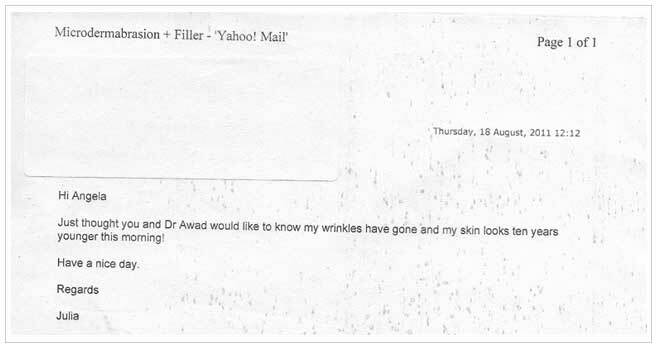 The treatment was explained to me in great depth and then was performed with the upmost care and attention. 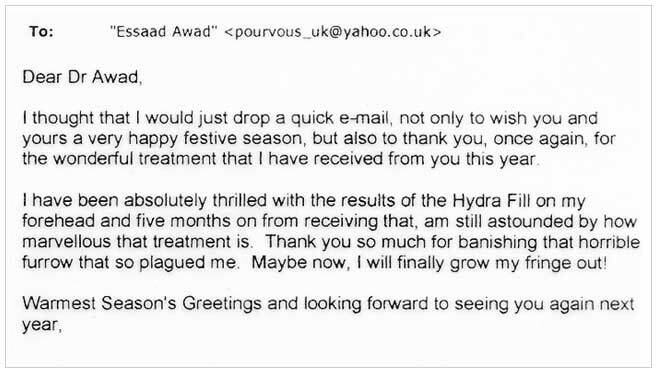 Dr. Awad was very understanding and reassured me throughout the treatment. 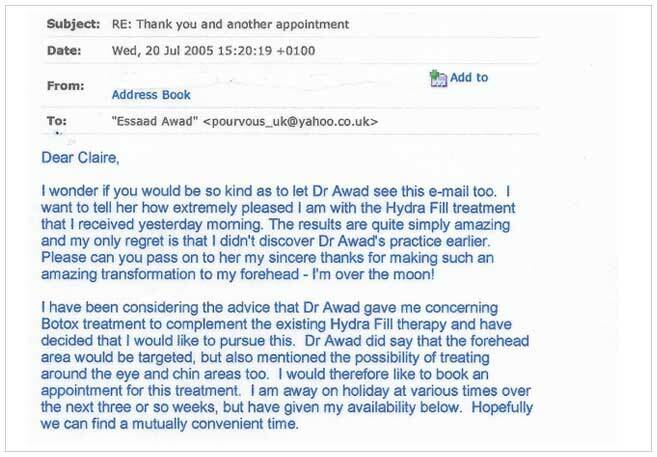 I am over the moon with what she has achieved and would totally recommend this clinic. We place a huge emphasis on customer service. We are proud of the reviews that we have received, and have worked very hard to build up an excellent reputation in the local area. If you are interested in talking to us about any of the procedures that we can offer, please do get in touch with us to make an appointment, or just phone us with any questions you might have. We are also running some current promotions which you can see below or you can click here to see our prices. We do hope to speak to some of you soon, and hope you can visit us to find out why so many local people value our service, and review us so highly.